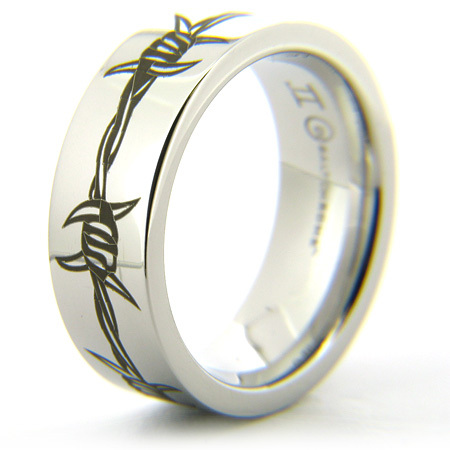 Cobalt chrome ring features a barbed wire laser design. Comfort fit ring is made in the USA. Width: 8mm. Cobalt chrome is a unique alloy blend that consists of cobalt and other substances to form a bright white alternative metal. It is as white as platinum, hypoallergenic, unbreakable, and scratch resistant. These bands are light-weight, inside round comfort fit and very comfortable to wear. This metal has been used in medical applications for years. Occasional polishing may be required. Weight: approx. 9 grams. More beautiful in person! Thick band, good quality, very "manly" looking. its a wedding band, have not been able to use it yet, we don't get married until June. But my fianc��� loved it and wanted to wear it right away.